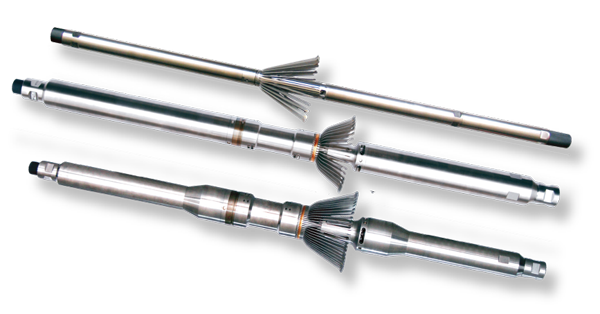 The Multi-Finger Caliper (MFC) has 24 to 60 high resolution calipers which measures the internal radii of the wellbore tubing and casing. Accurate measurements can be made in tubular sizes from 1.75 inches to 9.63 inches in diameter. The MFC uses a series of “contactless” displacement sensors and a corresponding number of measurement fingers. When moving along the inner casing wall, the radial displacement will be changed into an axial displacement of the sensor, which is then processed, coded, and transferred to surface system where the image of the casing will be obtained. The MFC can be used to detect casing deformation, bending, fractures, holes, scale deposition, paraffin build-up, and inner wall corrosion with high accuracy.